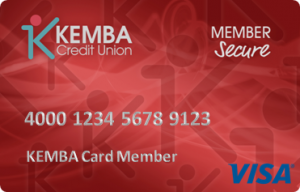 Visa Credit Cards from KEMBA Credit Union! This is a great card to use for everyday purchases while earning rewards! Introductory balance transfer rate of 3.99% APR for 12 months! Low balance transfer free, maximum of $10! Rewards program with cash back, gift card and travel options! Receive 500 Bonus Rewards Points with your first $100 in purchases in the first 90 days! A 3.99% APR on purchases for your first 6 months! If you typically carry a balance, this card is a great option for you! A great low rate card option! Special rate for balance transfers, 3.99% APR for 12 months! Low balance transfer fee, maximum fee of $10! 3.99% APR on purchases for your first 6 months! Do you need to establish or rebuild your credit? This card can help! A great way to build or rebuild your credit history! Credit lines starting as low as $300! Secured with funds on deposit at KEMBA! With our Member Rewards Visa you’ll earn 1 point for every $1 spent! Redeem points for Gift Cards, Cash Back (received as statement credit) and Travel! Access the Rewards store within your Credit Card online banking session or download the CURewards app. Earn 500 Bonus Points by spending $100 in the first 90 days. 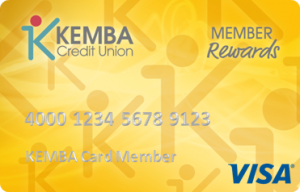 Rewards are only available with the KEMBA Member Rewards Visa Card. Start saving from the get-go with 3.99% APR for 12 months on balance transfers* and 3.99% APR for purchases for your first 6 months! *A balance transfer fee of the greater of 2% or $10 will apply. Managing your credit card will be easy! Access credit card online banking right in MyBranch online banking! Take care of your card on the go with our credit card mobile app! View your transactions, pay your bill and more. Search for KEMBA My Credit Card Manager in your app store today. Enjoy the benefits of a KEMBA Visa card without worrying about any looming fee. Easy breezy! Now you can transfer balances from your cards that do charge an annual fee! KEMBA is happy to offer you a Visa from your trusted financial partner. Now you can have a card designed to provide great features with a great rate! Enjoy on-the-go card management that’s fast, simple and convenient! Card members can manage their credit cards on the go! Download the My Credit Card Manager app from iTunes and Google Play now! 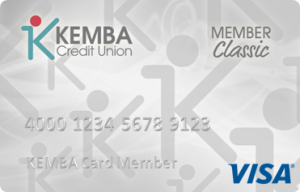 Don’t have a KEMBA credit card yet? Apply for one today and take advantage of a Visa card from your financial partner! Download the app from the store, grab your credit card, and register on your device. It’s that easy! You’re protected by 128-bit encryption through your mobile device. No personal information is stored on your mobile device. I’m not an Online Banking or Mobile Banking User, can I still use the Mobile Credit Card App? Yes, there is no need to be an Online Banking user to use this service. Enroll on credit card online banking in MyBranch. Click on your “Credit Card” account number to begin the registration process. Can I use my Online Banking login credentials for Mobile Credit Card App? No, you must complete the Mobile Credit Card App Registration process from your smart phone to create login credentials and set up security questions. Nothing! This is a free service. However, there may be charges associated with data usage on your phone. Check with your wireless phone carrier for more information. Yes, the Mobile Credit Card App service utilizes best security practices such as HTTPS, 128-bit SSL encryption and site time-out when the session expires. In addition, no account data is ever stored on your phone. And in the event your phone is lost or stolen, the service can be immediately disabled by calling the number on the back of your card, visiting MyBranch and accessing your credit card account, or calling our Call Center at 317-351-5235. We support all the popular US wireless phone carriers, including AT&T, Sprint, T-Mobile, and Verizon. A data plan is typically needed when you want to use the app when Wi-Fi is not available. Please check with your wireless carrier for more information. Which cards will I be able to see? Any KEMBA Credit Union credit card where you are the primary or secondary cardholder. How do I register for Mobile Credit Card? Download the app from the store, grab your card and register from the phone. You will verify your identity, select security questions and create a sign on Mobile Credit Card App User ID and Password. How do you use the information that I provide during Registration? The information you provide to verify your identity is used to validate account ownership. Only your security questions and answers and Mobile Credit Card App User ID and Password are stored by our system. What happens if I get a new phone or change phone numbers? Simply reinstall the app and start using it. There are no special arrangements necessary to suspend the app or card. I forgot my password, how do I reset my password? After entering your Username, tap on Login button. On the next screen select “Forgot Password?” link. You will be guided thru the change process. I forgot my username, how do I find out what my username was? On the Login screen, select “Forgot Username?” link. You will be guided thru the change process. How do I change my password or security questions? Sign on to the Mobile Credit Card App and from the Home screen, select Settings button. You will be guided thru the change process. Please call the phone number on the back of the card. For more assistance, please call us at 317-351-5235.